Yes, the Windows 10 has also a management program for hard drives. It is conceivable to very easily see the SSD or HDD (hard drive partitions) on Windows 10! Please start the Disk Management in Windows 10, the fastest on the shortcut Windows-X. Now you can see all the disks and partitions under Windows 10. 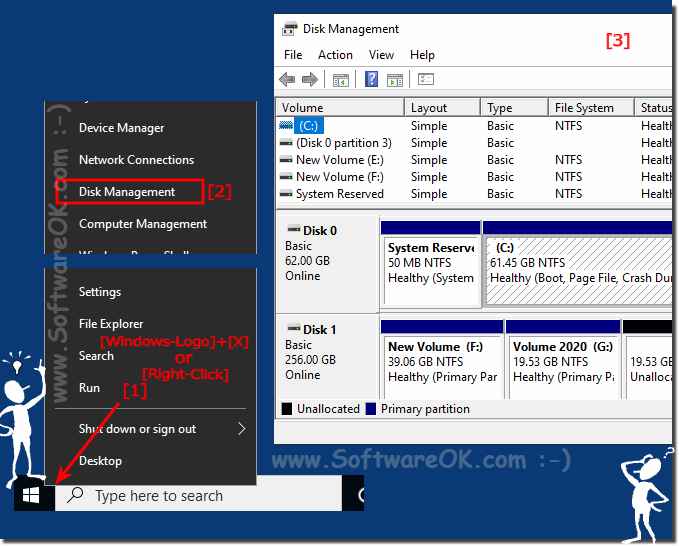 (Image-1) disks partitions on Windows-10 in Disk-Manager! The Windows 10 Disk Management is a system utility for managing hard disks and the volumes or partitions that they contain. With Disk Management, you can initialize disks, create volumes, and format volumes with the FAT, FAT32, or NTFS file systems. Windows 10 Disk Management enables you to perform most disk-related tasks without restarting the system or interrupting users. Most configuration changes take effect immediately. In this Windows 10, Disk Management provides the same features you may already be familiar with from earlier versions, but also adds some new features! Simpler partition creation. When you right-click a volume, you can choose whether to create a basic, spanned, or striped partition directly from the menu. Disk conversion options. When you add more than four partitions to a basic disk, you are prompted to convert the disk to dynamic or to the GUID partition table (GPT) partition style. Extend and shrink partitions. You can extend and shrink partitions directly from the Windows interface. Windows-10 - FAQ-89: Can I see the disks partitions under Windows 10? How can i view partitions on windows 10? Unable to see my hdd partition in windows 10? Windows 10 can't see partition? I cant see other disks on my pc? How to be able to view fat disks in windows 10? How to see the disk partition in windows 10? Cant see hard disk partition windows 10? How to view unmounted hdds windows 10? How to see partition windows 10? How to see my partitions in windows 10? Windows 10 cant see all parttions? Cant see partition win 10? How to see partitions in windows 10? How to see partitions windows 10? How to see partitions on windows 10? My windows 10 aint seeing my other partitions? Windows 10 recovery tool cant see disks?